Plants in Phoenix Arizona need supplemental watering. During the hottest, driest stretches of summer, even cactus can use some supplemental watering here. Keep in mind that the AZ cactus belt is in the high Sonoran desert, not the lower Sonoran desert where Phoenix is. However, as amazingly hot and dry as the lower Sonoran is, it has one important advantage for growing tropical plants and that is that freezing temperatures are infrequent. Add some urban parking lots, concrete walls, houses and swimming pools and freezing temperatures become even less likely. In addition to heat and cold, another consideration to keep in mind when growing plants here is that the water contains higher than average levels of alkaline salts. Therefore, getting enough water to tropical plants in the right way can be a challenge. Some gardeners like to water everything by hand. With a good knowledge of how much water a plant needs and the time to do it, this can be one of the best methods. Of course, the draw backs to this are not having the time, and not being able to water when going out of town. One week without water in the mid-summer is enough to stress many tropical plants, and two weeks is usually enough to kill them. It is for this reason that it is recommended, for any tropical gardener in Phoenix, to automate the watering of their plants. A timer having at least two schedules and at least 6 stations (able to control 6 valves), with each station having an individual duration setting is recommended. Outdoor timers can be bought for under one hundred dollars, but it is the putting together and digging in of the pipes that really costs time and money. If you have the luxury of moving into a new house, put serious thought into your irrigation plan up front because it is 100 times harder to change the layout once the landscaping is in than it is to put it in the first time. This is my recommended method of watering for Tropical plants. To start with, each plant has a bowl like basin constructed around it in the soil, approximately the size of the plants canopy diameter (larger for very small plants). A PVC pipe (3/4" recommended) is then run under the ground to the edge of each plants bowl and a riser leads to a bubbler head that comes up in the bowl. The bubbler should be as close to the edge of the bowl as possible so one can avoid digging too close to the plant in the case of later maintenance. Small plants need small bowls, so to keep the water pipe far enough away. It is often beneficial to make the bowl a key hole shape in the beginning, with the bubbler at the bottom of the keyhole. The biggest benefit of basin irrigation is that by flooding around the plant, water is forced deep into the soil. This encourages the plants roots to go deep. The plant won't need to be watered as much this way and will be more drought tolerant. This flooding also pushes salts in the water to the edge of the flood area, keeping them from accumulating around the plants roots. A nice feature of bubblers is that they can be adjusted to control the flow rate on each individual plant. Flood irrigation is only available to those living by canals. A gate is opened from the canal allowing one to flood their entire yard. One of the best things about flood irrigation is that the water is much cheaper than treated city water. Since one's yard becomes one big basin, flood irrigation has the same benefits as basin irrigation. However, one problem with flood irrigation is that it is difficult to give plants different treatment depending on their watering needs. For example, bananas need much more frequent water than citrus, and each will be unhealthy if treated like the other. Drip irrigation involves running many small lines, under the ground, to a plants roots. The big benefit is that less of the water is exposed to evaporation. This is the technique of choice by the cities in the Phoenix area and most of the businesses. It appears to work very well for xeriscape plants and also seems to work well for other plants, even for citrus in some cases. Some of the drawbacks are that those little hoses clog up with mineral deposits over time, and it takes a very long time to really flood a plant. It is also difficult to tell how much water a plant is getting and even more difficult to adjust the rate at which it is being watered. One cannot just rotate a bubbler head to change the flow rate. Furthermore, watering in fertilizer is more difficult when the water is being applied under the ground as well. If you want to keep things simple, I recommend staying away from drip irrigation for watering tropical plants. The major benefit of a sprinkler system is that it distributes water over a large area with a minimal amount of pipe. A problem with sprinklers is that by jetting the water through the air a large amount of evaporation takes place. This evaporation combined with the fact that the watering is generally superficial and frequent tends to deposit a layer of alkali salts over time. These salts can damage a plants roots and damage leaves that are exposed to the water spray. Due to these drawbacks, watering tropical plants with sprinklers is not recommended. However, if someone wants to keep their grass and plant tropicals within it, then watering with sprinklers is unavoidable. Being in the grass does have the benefit of raising the humidity level around the plant. In this case, it is recommended that the plant should be planted in a shallow basin, facilitating puddling. Also, the basin should be flooded with the hose periodically to leach away salts. Currently, I am growing mangoes in my lawn using this technique and it appears to be working quite well. Some plants are more sensitive to having their leaves sprayed than others, so this should be taken into account. One plant that should definitely not be put in the lawn is citrus. A lot of people do this and a lot of people have sick and dying trees in their lawn. To be healthy, the soil around a citrus should dry out between waterings and this cannot happen in a sprinkler watered lawn. Some flood irrigated lawns have healthy citrus trees but the lawns generally will look dried out. The typical irrigation timer has at least two watering schedules. 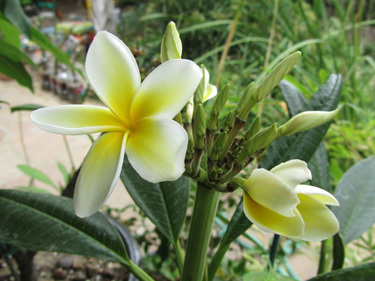 Fortunately, most tropical and subtropical plants will stay healthy on either the grass or citrus watering schedules. A cactus watering schedule is also included below for reference. Plants that like lots of water are happy on the same schedule as your grass. This schedule equals a watering frequency of every other day in the hottest part of summer and every one to two weeks in the coldest part of winter. Other times of the year fall between these two extremes. Definitely do not water any plant (except maybe lily pads) every day no matter how hot it is.Watering every day is a waste of water and will make most plants sick. The duration of the watering each time can vary depending on what type of plants you have and how much sun they get. For example, grass does well with 15 minute sprinkler waterings in shadier spots and 25 to 30 minute waterings in sunnier ones. For this reason, water can be saved by having different zones for the sunniest and shadiest parts of your lawn. In addition to controlling watering frequency and duration, one can also control the rate at which water is applied. For example, sprinklers have screws for adjusting flow and throw, and for plants other than grass bubblers offer precise control of flow rate. Citrus like to dry out between waterings. In the hottest part of summer this schedule equals watering once every one to two weeks, and in the winter once every four to six weeks. Other times of the year fall between these two extremes. Newly planted trees need more frequent waterings. For the first two weeks after planting, water every three days. After that, the normal schedule should be followed. When watering citrus flood them very thoroughly for 30 minutes to an hour. Examples of other plants that fall under this schedule are bougainvilleas and oleanders. Interestingly, established oleanders need even less water. They are almost as tough as cactus, which is surprising considering how lush they look. Cactus native to Arizona need almost no supplemental irrigation. In fact, the best way to kill a cactus is to regularly water it. When frequently watered, the roots of a cactus will rot. Also, a saguaro that is watered will be constantly bloated which causes fissures to develop in its accordion like folds. These injuries will become diseased and fungi and other parasites will eat away the plant, eventually killing it. However, there are some situations where a cactus can use some water. For example, if there has been a month of temperatures exceeding 105 degrees with no rain then a cactus can usually use a drink. A thirsty cactus can be easily identified because it gets very skinny. In this case, give the plant a good deep soaking with the hose and it will be ready for another month of the same weather. Sprinkler heads that attach to the end of a hose work well for cactus patches. This kind of severe weather is more likely in the lower Sonoran desert than in the upper, because the upper is more of a natural habitat for cactus and is cooler and wetter than the lower. Cactus not native to Arizona might need more watering. 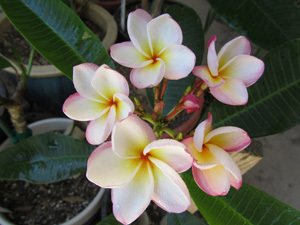 © 2011 - 2013, Pali Plumerias - All rights reserved.